At 6pm on 24 September 1975, Doug Scott and Dougal Haston, staggered up the final slopes of Everest’s Southeast Ridge and became the first two Brits to stand on top of the world’s highest mountain. They had also become the first to ascend by the Southwest Face, joining the standard Southeast Ridge route close to the South Summit, in a classic siege-style expedition led by Chris Bonington. 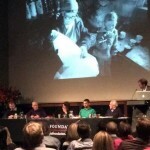 At 7pm on 24 September 2015, forty years later, ten members of that expedition assembled at the Royal Geographical Society to recount their achievement (though sadly not Haston, who died in a skiing accident in Switzerland in 1977). It’s at times like these I realise how lucky I am to live in London, and how privileged I was to attend. 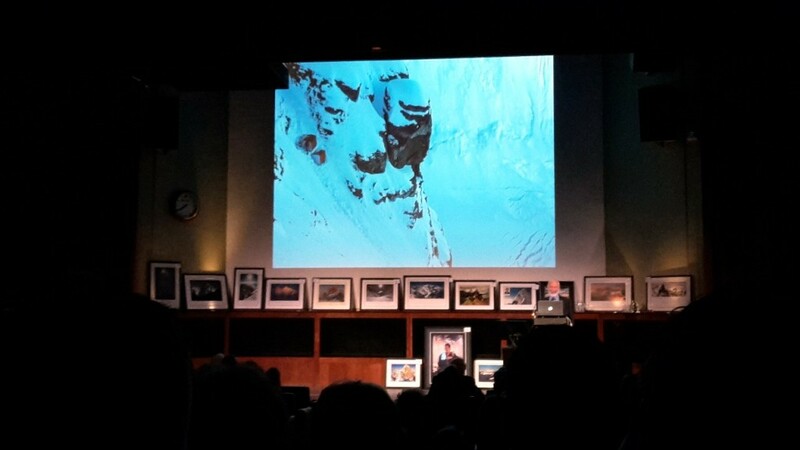 Sir Chris Bonington started the show with some background about his previous attempt on the Southwest Face in 1972, as well as a bit about their funding for the expedition (there was a chap from their sponsor Barclays Bank in the audience, so we remained polite and didn’t snore too loudly). This introduction was very brief, and soon he was describing the approach march from Kathmandu to Everest. This was done in two teams, an ‘A’ team, led by Bonington himself, and a ‘B’ team, led by Hamish MacInnes. He handed over to Mike Thompson, a member of the ‘B’ team, who went on to describe how the ‘A’ team consisted of doctors, engineers, and other educated professionals (Sir Chris’s type of chap), while the ‘B’ team comprised less well-educated, more fun-loving types, who all believed their leader had chosen his summit team already. They spent their trek sun-bathing and smoking a good deal of what Mike called the local vegetable, as he put a large photo of Doug Scott up on the projector, with what appeared to be a huge pipe in his mouth (though it was actually a wooden mallet). They reached base camp, and he handed over to Charles Clarke, the expedition doctor and a member of the ‘A’ team. He described how this was his first high-altitude expedition, so he went to visit the doctor from Bonington’s 1972 expedition for some tips on high-altitude medicine. “You need to be able to recognise cerebral and pulmonary edema, but the aim of the expedition is to reach the summit, so everything else you can ignore,” was the advice. Chris and Mike then described the early stages of the climb up the Southwest Face as they established camps and carried loads. Much of this focused on the gargantuan tents which weighed an astonishing 120kg and resembled scaffolding. I’ve previously heard these particular tents described as Whillans Boxes, after their designer Don Whillans, whose forte was clearly climbing rather than tent design. Here they described them as MacInnes Boxes, after deputy expedition leader Hamish MacInnes, who was the only one who knew how to erect them. They carried several of these monsters up the steep lower snow slopes of the Southwest Face. Rectangular in design, they had adjustable legs at the front which enabled them to be pitched horizontally on any slope, however steep, and came with extra kevlar sheets to drape over the top and divert avalanches. One thing they didn’t have was an en suite bathroom, which Sir Chris decided to illustrate somewhat gratuitously with a photograph of one (unnamed) team member squatting in the snow with his trousers and underpants around his ankles, and a drop of several hundred metres below him into the Western Cwm. All of the team members were keen to mention the contribution of their Sherpas, two of whom – Ang Phurba and Pertemba – were present at the event. Mike showed a photo he took looking down the face, with a line of Sherpas strung out all the way down to the Western Cwm. Doug Scott described how Ang Phurba came within a few metres of the summit the following year, but abandoned his attempt to help another climber stricken with cerebral edema back to the South Col. The stage was set for Paul ‘Tut’ Braithwaite to describe how he and Nick Estcourt established the crux of the route, up a narrow snow gully between a band of rocks high up on the face which had thwarted previous attempts on the Southwest Face. They were expecting to take up to three days to establish this part of the route up to Camp 6, from where they would be able to launch their summit attempts, but Tut and Nick managed to do it in a single day of exceptional climbing. “Just as we were about to set out, we saw a huge avalanche come crashing down the very gully we were intending to climb,” said Tut. He even managed to take a photo of the tons of snow billowing down between rocks. The avalanche was enormous, and had they been climbing the gully at the time there would have been no chance of survival. They took a decision very few people in the audience would have made, but that’s why we were in the audience and they were on the stage. They kept to the right of the gully to give themselves some protection, rather than in the middle, where the snow conditions were better but the full force of any avalanche would be directed. They didn’t think about the altitude. Tut described how it felt like a Scottish gully, and they treated it like any other winter day out in the highlands. But the risks were much greater than Scotland in winter, and one of the dangers was hypoxia. Towards the top of the gully they ran out of oxygen. In his hypoxic state Tut removed his oxygen cylinder to save weight, and left it in the snow. Then he tied a rope around it to make an anchor and lowered the rope down the slope for his team mate. “Nick was quite surprised when he jumared up the rope and discovered we were both attached to the slope by nothing more than an oxygen cylinder,” said Tut. 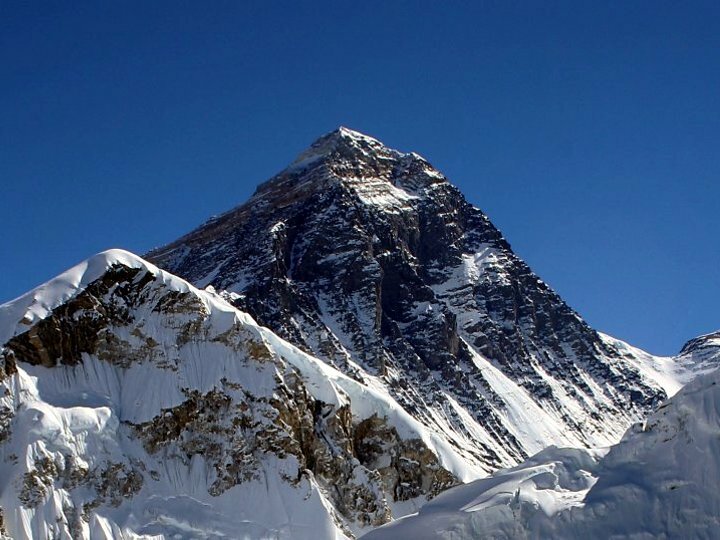 They were now over 8000m, but it didn’t occur to them to descend just because they had run out of oxygen. This was 1975, three years before Reinhold Messner and Peter Habeler made the first ever oxygenless ascent of Everest, and many people still believed the feat was impossible. Tut and Nick didn’t even discuss it. They were having a good day and they simply carried on without it. At the top of the gully they had a difficult traverse to the right underneath a rock face, which led to a snow ramp where they could establish Camp 6. Tut had some fantastic photos of Nick Estcourt leading this section, as well as shots back down the narrow gully. By the time they descended back to Camp 5 they were both exhausted after a 15 to 17 hour day, 8 to 10 of which had been spent without oxygen. They’d had an incredibly successful day and unlocked the crux of the ascent, going a long way towards ensuring the success of the expedition. But for Tut their day had almost been too successful, and as he described what followed we sensed a hint of lifelong regret. He and Nick were exhausted and had to descend to recover. The following day seven of the team were able to climb up the gully he and Nick had fixed and establish Camp 6 in a single carry. Six members of the team were now in a position to make summit attempts, but Tut and Nick would have to wait for a later opportunity. That opportunity never came as the weather closed in and the expedition was abandoned. For the others the expedition was far from over. We had to wait a while to hear the rest of it, though. 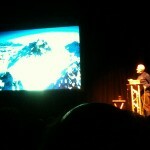 Tut’s unpretentious but passionate presentation ended up being the highlight of the evening for me. Next came a half hour interval, followed by another one of Doug Scott’s auctions of signed photographs on behalf of his charity Community Action Nepal (CAN). I’ve been to some talks where his auctions have been less than successful and tumbleweed has drifted across the auditorium. Let’s face it, we’re there to watch the show, and most of us are unwilling to part with hundreds of pounds for the privilege, however worthy the cause. On this occasion there seemed to be a number of exceedingly wealthy people in the audience. 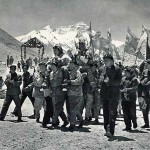 Several of the photographs went for four-figure sums, including one signed by Sir Edmund Hillary for a staggering £2,500. We’re all different, and I’m sure the person who bought it had no regrets. Personally I would rather support the people of Nepal by spending £2,500 on a three-week trip. But it was a great night for Doug’s charity, and he preceded the auction by showing us a number of photos of schools and hospitals supported by CAN that had been destroyed in April’s earthquake, so I have no doubt the money he raised will be put to great use. 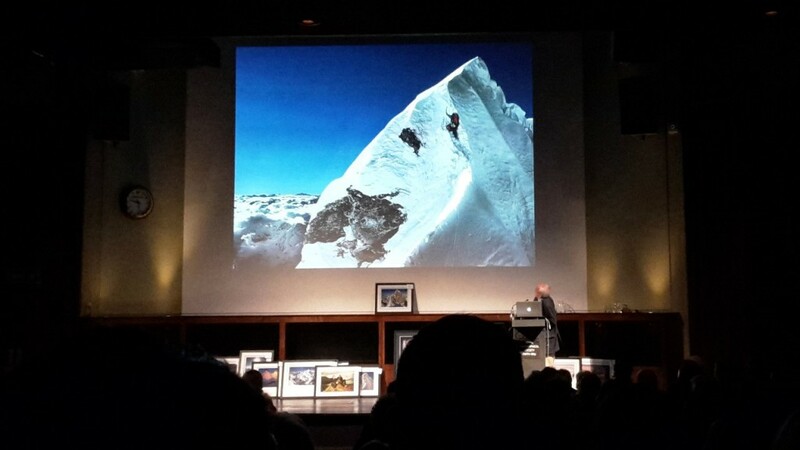 With the auction done, Doug Scott went into his part of the presentation, his successful summit attempt with Dougal Haston. It was a long day and they didn’t reach the top until 6pm, when the sun was starting to go down. Setting out from Camp 6, they followed the snow ramp all the way to a position on the Southeast Ridge close to the summit, where they joined the better-trodden path of Everest’s standard route. Remarkably, Dougal Haston lost a crampon shortly after setting out, and completed the remainder of the climb in just his boots (obviously he had the rest of his clothes on as well). 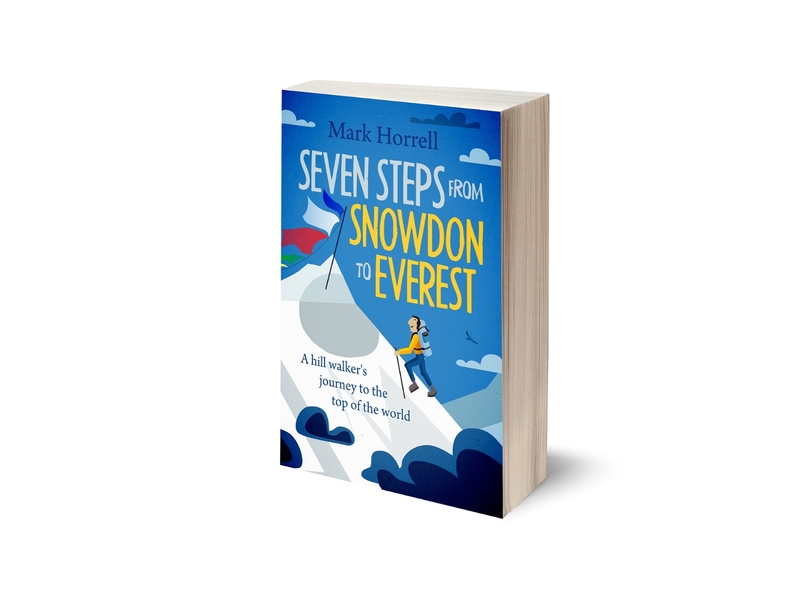 It was a post-monsoon ascent, which meant he was able to climb the Hillary Step by kicking steps in the powder snow, where Hillary had needed to climb up it by leaning backwards onto a sheet of corniced ice. The narrow ridge, with its overhanging cornice on the right-hand side which fell 3000m down the Kangshung Face into Tibet, figured prominently in the presentation. Doug described how he had an out-of-body experience as he traversed along it. He felt like he was floating in the air a few metres above his body, willing himself to keep a safe distance from the edge. Just before they reached the top, Doug’s camera ran out of film, and he had to stop and change it. His fingers were freezing, but he knew he had to do it. Dougal had no camera, preferring to savour the experience, rather than document it for posterity. He hadn’t taken a single photo all expedition, but Doug persuaded him to take a couple of himself as he stood on the summit. They descended as darkness was falling, and had to endure an icy bivouac at 8750m on the South Summit. They had no sleeping bags, and the risk of frostbite was significant. At one point during the night Doug had to remove his boots and put his feet underneath Dougal’s armpits to warm them. It must have been sheer hell, but Doug described their night together in typically understated, bantering fashion. They’d had no contact with the rest of their team, and it was a relieved and elated Chris Bonington that Doug spoke to by radio when they got back to Camp 6 many hours later. He was able to say they had both reached the summit, and they were both well. 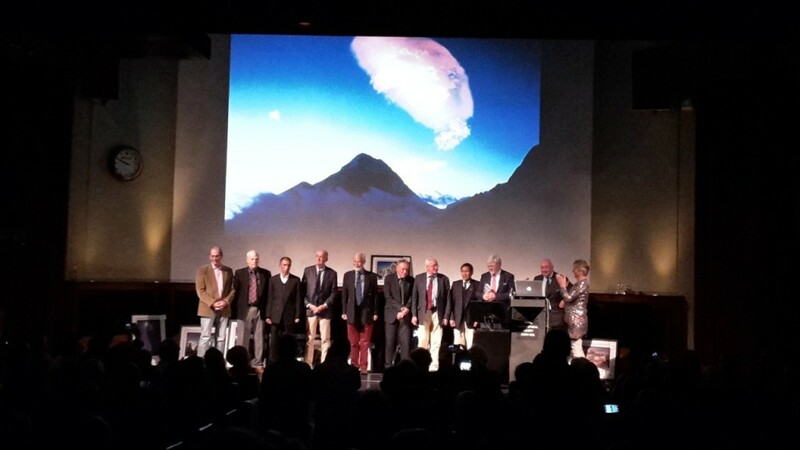 Members of the 1975 Everest Southwest Face team. Those I can remember are the seven in the middle: Ang Phurba Sherpa, Paul ‘Tut’ Braithwaite, Sir Chris Bonington, Mike Thompson, Doug Scott, Pertemba Sherpa and Charles Clarke. The expedition wasn’t over, and nor was our presentation. Pertemba Sherpa came onto the stage to describe the harrowing second summit push. Pertemba wasn’t as slick a speaker as the others, but nobody held that against him. For a start, he was the only one not talking in his native language. It was also a privilege to hear him speak at all. He is one of the 10 great Sherpa mountaineers of a previous post I wrote, and his appearances in public are a rarity (unlike Doug Scott and Chris Bonington, whose lives nowadays seem to be an endless series of talks about their many historic ascents). But most of all, Pertemba is the one remaining survivor of their second summit push, so it was him or no one. Weather conditions were considerably worse for Pertemba and Pete Boardman than they had been for Doug and Dougal. They reached the summit in a whiteout and didn’t linger. As they were descending to the Hillary Step they were astonished to encounter Mick Burke ascending on his own. Mick asked them to return to the summit with him so that he could film them, but they were keen to descend in the poor conditions. They told him to continue to the summit on his own, and they would wait for him at the South Summit. They waited for an hour and a half, but Mick Burke never returned. It is likely that he strayed too close to the edge in the whiteout, and fell through the cornice that Doug Scott was only able to avoid by leaving his body and guiding it as he hovered a few metres above. Pertemba and Boardman still had a difficult descent ahead of them to reach the safety of Camp 6 in worsening conditions. At one point they lost the route and had to climb back up again. Pertemba lost a crampon, and they were mightily relieved to spy an anchor in the snow, and the fixed rope which led them back to camp. 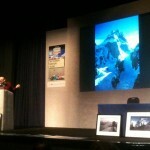 Sir Chris Bonington returned to the stage. 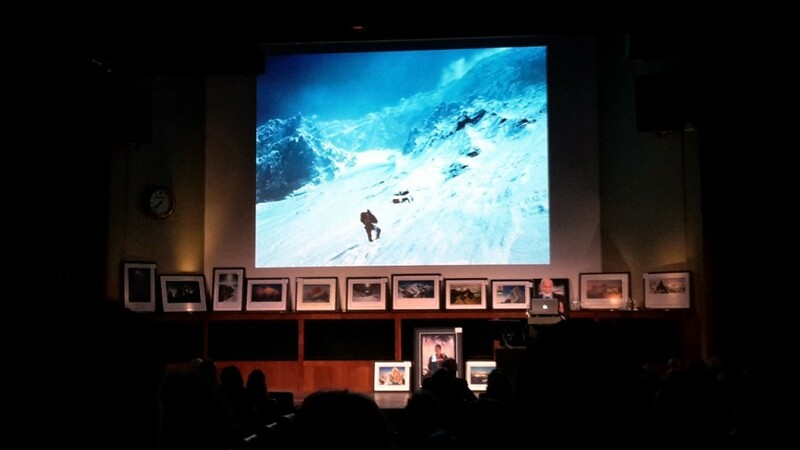 He described how the success of the expedition had been all about teamwork, and pulled up a huge team photograph of the dozens of British climbers, Nepali Sherpas and porters who had been an essential cog in that success. On that note all ten members of the expedition who were present in the auditorium came onto the stage, and we all had the opportunity to take another big team photo, privileged to have heard about a historic ascent of Everest straight from the horse’s mouth. Nice article Mark, thanks for sharing your night out…. Hey, Robert, London does have some advantages over Nebraska you know! The Whilans boxes weighed 120kg? Are you sure? The ones they had for the Annapurna South Face expedition in 1970 weighed 48lb=22kg (see https://www.dropbox.com/sc/rgi7za4h7k7zjdg/AAA4wgQFEipa1vKnc-b7igT3a, last two paragraphs of the left page and first paragraph of the right page). A nearly sixfold increase in weight eight years later seems bizarre. Were they still two-man tents, or did they make them larger for the Everest expedition? Yes, you’re right it sounds odd, but that’s what Sir Chris told us. Perhaps he meant to say 20kg. I really enjoyed this, thanks for sharing it.